When Rosa and Raffaele Balzano moved to Genoa from Naples years ago, they brought with them rich southern flavors and sunny hospitality. This elegant, expensive restaurant got its first Michelin star in 2003 — deserved recognition for a dedication to quality and originality. The tuna and legume terrine is a show-stopper, and Raffaele’s handmade chocolates are to die for. 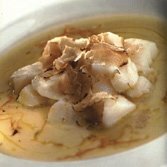 Michelin suggestions: Sformato di stoccafisso con pesto leggero, stockfish in light pesto, Spaghetti alla chitarra con pesce e bottarga di tonno, spaghetti with fish and dried mullet roe (poor man’s caviar), and Trilogia di cioccolato extrabitter e crema alla lavanda, extra-bitter chocolate “triology” with lavander cream. Closed for Sunday dinner and Aug. 8-28.